Here some information about the building and the demolishing of the first Riga Synagogue is presented. The information about the building is copied from "Rigasche Almanach. 1873". In fact the Almanach was a kind of calendar that was printed in German for the German community, and every issue as a rule held a gravure of a building in Riga and a portrait of a brilliant German man from the Baltic provinces. Some texts always were added to the gravures. The gravures made the books rather valuable, and I used for this Site the copies I borrowed from K.Beloglazovs. The picture of Riga Synagogue and the appropriate text is copied here. It contains information on the history of the building and its description. The text is signed by W. K. and P. H., unfortunately, I do not know who in fact were the authors of the text. The construction of the building was started in 1868 and finished in 1871. 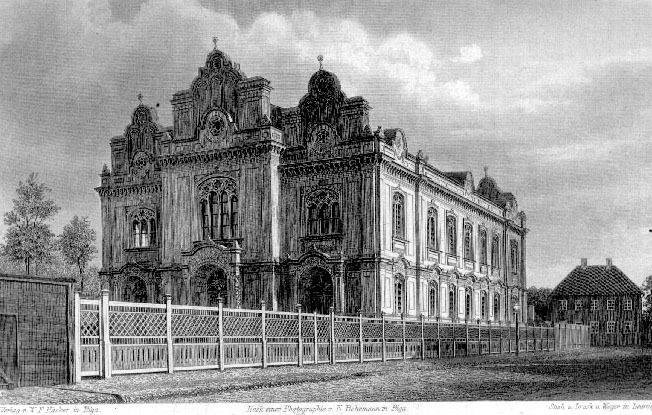 Three years were needed, because the Jewish community decided to increase the dimensions of the building when the construction was already going on It is assured that the supervisors (curators) of the Kahal - the chief of the Police general Koslow (in 1873 he worked in the same position in St. Petersbourg), and a member of the municipal Council - A.H.Hollander were the most active in the organization of the construction process. The author of the project was Hardenack, the builder was Krüger. As far as I know, nobody of the above mentioned was a Jew. Nothing in the text is said about the financing of the project, but no doubt it was upon the Jewish community. The opening ceremony in August 1871 was guided by the Chief Rabbi Pucher of Jelgava [Mitau]. The text below informs that Jews for long time were not allowed to buy the ground for the placing of the Synagogue. In the book of A.Buchholz /Buchholtz/ some additional information is published and it is made available on this site (In German). The local authorities did not permit the deal, because the Empire Laws prohibited Jews from having a real property in Riga city. The Jewish community did not give up and petitioned at the Minister of the Interior of the Empire. The Minister explained that a particular Jew really was not allowed to possess any real estate in Riga city, but there was no Law prohibiting the Jewish community as a legal entity from buying land in this city. The social status of Jews is the best measure of both the tolerance and the liberty of conscience in countries and peoples. If the first increases or decreases in a country, then at the same moment it is possible to conclude about the second in the same country, and the conclusion drawn in this way always will and can be the most precise and truthful. We now need not - thanks to the progress in time and culture - to go anymore to France, Netherlands or Belgium in order to bring a proof for this assertion. At the contrary, the proof stands before our eyes and we need only to keep them open in order to recognize it for the honor of the humanity and for our own delight. The "Rigasche Almanach" proposes to its readers the picture of the nice and beautiful building that should bring this proof for our dear father-city. This was written about the events of August 1871. On July 4, 1941, that is 70 years later, the Synagogue building was burned down some days after the Nazi troops entered Riga (July 1, 1941), which started the Holocaust in the region of Latvia. It is known that many Jews perished in the burning Synagogue and that they were mainly from Ðiauliai. They tried to escape the Nazi Army by moving in the northern direction to Riga but were trapped there and obviously were allowed by local Jews to stay at the Synagogue. The list of Jewish doctors in Latvia compiled by Eva Vatere /Vatere/ informs that Hana Paturska, a dentist, was burned in this synagogue. The memoirs of a holocaust survivor Elmars Rivoðs /Koval/ assert that Moòa Nags was captured on Riga streets and burned alive in a synagogue, maybe in this one. Actually at this day at least three synagogues were burned down. The both authors do not inform what were their sources of the primary information. J.Jiezçns, who joined the Nazi killer squad in August 1940, after the war witnessed to the investigators of MGB that the Jews in the Synagogue were shot before the fire was set, and named the commander of the group Viktors Arâjs and one of the killers - Çriks Tobiass (See - /Silabriedis/, where the facsimile of the original written evidence is published). This witness did not see the action by himself, however, but heard the stories about it in his squad. The name Jiezçns in the spelling Iezçns was found on the list of the participants of Arâjs Command /Ezergailis/ and on the list of arrested persons /Prâvas/. It seems technologically rather reasonable to shot all of the Jews in the Synagogue, because the process of the fire setting was rather complicated - this was a stone building, and firewood and gasoline was brought to arrange a good fire - the Jews could only disturb the hard work in setting the fire. The total number of the victims is very difficult to estimate, because various sources give different figures: from a fantastic one - 2000 to nobody at all. J.Jiezçns wrote in the above mentioned evidence that he had heard stories that several hundreds of Jews were killed in the Synagogue. I think that the most realistic number were about 100, however. The burning took place in Shabbat evening, and one could suppose that many Jews visited synagogues, but at that time the curfew was imposed, and nobody was allowed to walk on streets in the evening. But, of course, the 2000 Jews not burned in the Synagogue on July 4, did not survive the Holocaust. In any case, if you have any Jewish relatives who lived in prewar Ðiauliai you may consider the possibility that they tried to escape invaders in the Northern direction and to perish in Riga Synagogue. Die sociale Stellung der Juden ist der beste Maßstab für die Gewissensfreiheit und die Toleranz der Staaten und Völker. Das Sinken und Steigen des ersteren in einem Lande läßt sofort auf den höhern oder tiefer Stand der letzteren in demselben Lande schließen, und der so gezogene Schluß wird und kann immer nur ein wahrer und richtiger sein. Wir brauchen - Dank sei beim Fortschritte der Zeit und der Cultur - nun nicht mehr, wie früher, nach Frankreich, Holland und Belgien zu gehen, um uns den Beweis für diese Behauptung zu holen. Er liegt vielmehr jetzt überall klar vor unseren Augen und brauchen wir dieselben nur offen zu halten, um ihn zur Ehre der Menschheit und zu unserer eigenen Freude wahrzunehmen. Das schöne und stattliche Gebäude, dessen Abbildung der "Rigasche Almanach" seinen Lesern giebt, soll diesen Beweis in Bezug auf unsere liebe Vaterstadt liefern. Ein Häuflein Juden, welches, in Folge einer vom Staate beabsichtigten Colonisation, aus Deutschland und Litthauen nach Livland eingewandert, und dem der Flecken Schlock zur zeitweiligen Niederlassung angewiesen wurde, war am Anfang unseres Jahrhunderts nach unserer Stadt umgesiedelt, wo es lange Zeit unter der mittelalterlichen Bezeichnung von "Schutzjuden" geduldet wurde, ohne daß ihnen jedoch zur Sicherung ihrer Existenz irgend welches Recht auf Handel und Gewerbe - die einziegen diesem Stamme in unserem Vaterlande zu jener Zeit zugänglichen Lebenszweige - zuerkannt gewesen wäre. Selbst das Recht, sich ein Gebäude zur Abhaltung des öffentlichen Gottesdienstes käuflich zu erwerben, wurde ihnen lange verweigert. Wie sieh'ts aber jetzt mit der jüdischen Bevölkerung unserer Stadt im Einzelnen, wie im Ganzen aus? Wie viele Läden und sonstige Geschäfte tragen nunmehr jüdische Firma, und wie viele Häuser, darunter recht stattliche, haben die Nachkommen der früheren, kaum nur geduldeten Schutzjuden zu ihren Besitzern? Was aber den Fortschritt unserer Zeit in dieser Beziehung am besten kennzeichnet, ist wohl das in Abbildung gegeben Gebäude. Die Existenz desselben und seine Lage an einer offenen Straße, und in nicht großer Entfernung von zwei christlichen Tempeln, beweist, daß man auch bei uns bereits aufgehört hat, es der reinern Begriffe von Gott und Menschheit für unwürdig zu halten, die Bekenner einer vom Staate geduldeten Religion zu zwingen, ihre Versammlungen und Zusammenkünfte zur Anbetung des höchsten Wesens in entwürdigender Weise, wie Verbrecher in geheimen, steckten Schlupfwinkeln abzuhalten. Die Art und Weise, wie dieser Bau zu Stande gekommen, und dessen künstlerische Ausführung legen das sprechendste Zeugniß von dem ab, wie freisinnige, vom Geiste userer Zeit durchdrungene Männer, dem christlichen Bekenntnisse angehörend, es sich haben herzlich angelegen sein lassen, um die Herrichtung eines zeitgemäßen Asyls für das fremde jüdische Bekenntniß sich die größten Verdienste zu erwerben. Was die künstlerische Thätigkeit des Architekten und des Bauunternehmers an diesem Bau gethan, wird jedem Beobachter hier vor die Augen gestellt. Besonders hervorgehoben müssen aber die großen Verdienste werden, welche sich Männer, wie der frühere hiesige, jetzt Petersburger Polizeimeister, Generalmajor Koslow, und der hiesige Raths- und Steuerherr A.H.Hollander, als Curatore des hiesigen Kahalsamtes, um die Herstellung des Baues erworben haben. Wir wissen aus zuverlässiger Quelle und übertreiben nicht, wenn wir sagen, daß der Wunsch der hiesigen jüdischen Gemeinde, statt des alten, engen, baufälligen, ein neues, der vergrößerten Gemeinde und den Anforderungen der Zeit entsprechendes Gotteshaus zu besitzen, ohne die Bemühungen dieser beiden Herren noch lange blos ein frommer Wunsch geblieben wäre. Die Baufälligkeit des alten unscheinbaren Häuschens, welches bisher als Synagoge gedient und durch seinen Zustand bereits die Aufmerksamkeit der Behörde erweckte, mag ihren zwingenden Antheil zu dem Entschluß, eine neue Synagoge zu erbauen, beigetragen haben. Und so wurde im Jahre 1868 der Bau begonnen. Das Project dazu ist von dem derzeitigen Gouvernements-Architekt Hardenack angefertigt und der Bau unter seiner Oberleitung durch den bekannten und beliebten Bauunternehmer Maurermeister Krüger in anerkennenswerther Weise ausgeführt worden. Durch eine, während der Arbeit von der Gemeinde für nothwendig befundene Vergrößerung konnte der Bau erst im dritten Jahre nach dessen Beginn zu Ende gebracht werden, und im August des Jahres 1871 fand die feierliche Einweihung durch den Mitauschen Oberrabbiner Pucher in Gegenwart der hohen Autoritäten der Regierung und der Stadtverwaltung, so wie viele geladenen Gäste statt. Das Gebäude ist in Berucksichtigung der schwierig zu beschaffen gewesenen Mittel möglichst einfach in seiner Ausstattung im Renaissancestyl gehalten; namentlich sind Gegenstände, welche, ohne gerade nothwendig zu sein, bedeutende Kosten beanspruchen, vermieden, wie z. B. Kuppeln. Durch die in Bogenschwingungen aufsteigenden Giebel ist aber der, zur Höhe strebende Charakter des Gottestempels gewahrt. Nur im Innern ist einiger Luxus in der Ausstatung des heiligen Schrankes, in den Säulen und Gittern der Chöre, in den, in farbigen Glas arrangirten Fenstern und in der Gasbeleuchtung entwickelt. Das Gebäude konnte zwar nicht ganz frei zu stehen kommen, sondern befindet sich auf einem noch anderweitig bebauten Eckplatze mit der südlichen Langfronte an der Straße, doch ist vor der mit drei Portalen gezierten Eingangsfronte ein geräumiger Platz freigelegt worden, so daß von der Straße zwei Seiten vollkommen sichtbar sind. Den Abschluß an der Straße bildet vorläufig ein hölzerner Gitterzaum, welcher mit der Zeit durch eisernen ersetzt werden soll. W. K. u. P. H.